In turn-of-the-century England, Gertrude Bell (NICOLE KIDMAN) rebels against the stifling rigidity of life, leaving it behind for a chance to travel to Tehran. There, she begins a lifelong adventure across the Arab world, a journey marked by danger, a passionate affair with a British officer (JAMES FRANCO), and an encounter with the legendary T.E. Lawrence (ROBERT PATTINSON). Queen of the Desert reveals how an ahead-of-her-time woman shaped the course of history. The only feature is the Theatrical Trailer. However, there is reversible cover artwork. 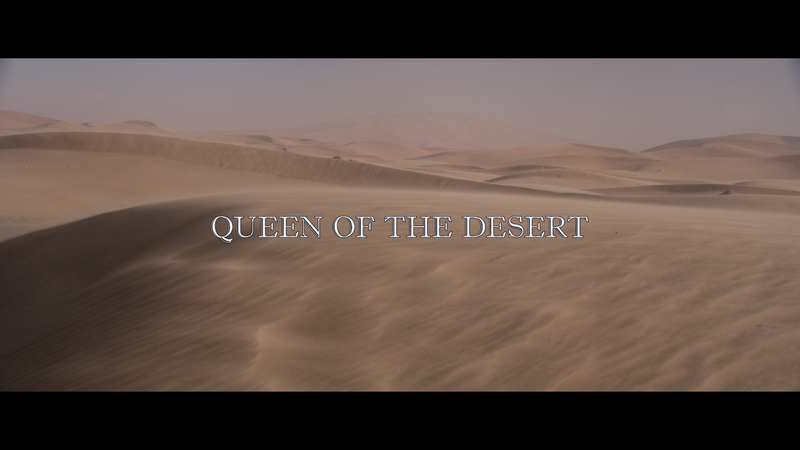 Queen of the Desert arrives on Blu-ray presented in its original 2.40 widescreen aspect ratio and given a 1080p high-definition transfer which greatly showcases the (mostly) Moroccan landscapes. Detail looks sharp and nicely defined throughout and colors tended to move more towards the natural spectrum. The disc comes with both a 5.1 and 2.0 DTS-HD Master Audio tracks. The former, which is what I watched the film with, only briefly going to the 2.0 option, sounds fine but hardly anything incredible, but dialogue levels were crisp and clean and especially when Bell is travelling through the desert, the ambient noises come to life through the front and, especially, rear channels. Overall, Queen of the Desert is a finely acted, especially on the part of Nicole Kidman, film about an important time in the Middle East, however it is slow plodding and can be trying to sit through, so I can’t really recommend this sadly. The Blu-ray meanwhile is on the basic side with good video/audio transfers but only a trailer in the features department.